The title ‘Food Fight‘ might conjure images of piffing pies, splattering bowls of spaghetti and people spraying ‘cream’ from a can. That’s certainly one way to have a food fight but this food fight is of a different kind altogether. Food Fight! is an interactive children’s book created for your iPhone or iPad. Written and narrated by Glenn Melenhorst, Food Fight! 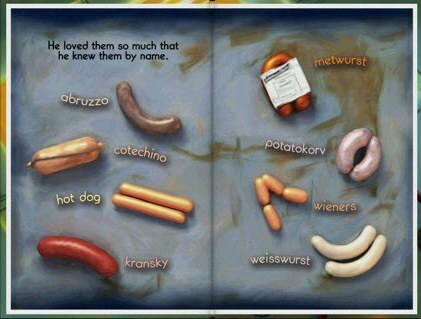 tells the story of Tim, a little boy that loves to eat sausages (at the expense of vegetables). 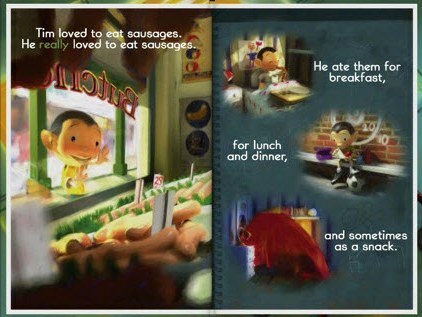 In another place, far from Earth, we meet Sammy, a sausage who loves nothing better than to snack on little boys. Imagine Sammy’s horror when the headline on his morning newspaper says “BOY EATS SAUSAGE!” Something has to be done! I won’t give away the whole story but the ending is clever (and leaves room for a sequel). Food Fight!, originally released as a traditional-style book titled Little Boys, has lots of cool interactive features and children are likely to discover more each time they ‘read’ the book. Expect everything from sausage sound effects and fluttering butterflies to a sun that rises and sets and a volcano of Brussels sprouts – I particularly like the musical boxes of little boys that you can compose tunes with. The short clip below shows just some of the special effects. Food Fight! also includes all the electronic book features that we have come to expect as standard – a ‘read-to-me’ button that can turned on or off, follow along text, realistic page turns and the ability to highlight individual words. It is worth noting that Melenhorst is Australian and therefore the book is read in a clear, Australian accent. Sure, Food Fight! covers the issues of prejudgement, food intolerance and ultimately conflict resolution but you can justify it simply on the basis of its gentle humour and charming illustrations. Food Fight! is $4.99 and available from iTunes. Check our previous posts on apps here.